Radiation dose is measured in Gray (Gy) and is defined as the absorption of one joule of radiation energy per kilogram of matter. 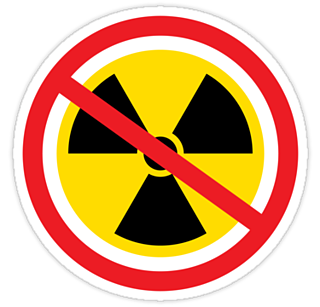 1 As a reference, a full-body X-ray examination's radiation dose is less than 0.01 Gy. M2 Optics is offering the best radiation hard optical fiber in the market by partnering with renowned manufacturers such as Corning® or Prysmian®. An optical fiber could be exposed to different types of radiation, from cosmic radiation in the outer space to merely a physics lab with gamma or X-ray sources nearby. Fluorine-doped optical fiber is commonly used to overcome RIA, and can efficiently improve it. Although high for single mode fiber, for a 10kGy radiation dose (room temperature), the RIA is approximately 0.25 dB/100m 3. Even at 2MGy, the RIA is well controlled at one dB/100m 3. In addition to low RIA, the recovery rate is much faster compared to pure silica glass core (PSC) as seen in Figure 1. The optical fiber is recovered to its original state almost immediately after radiation is removed and becomes stable as you can see from above diagram. 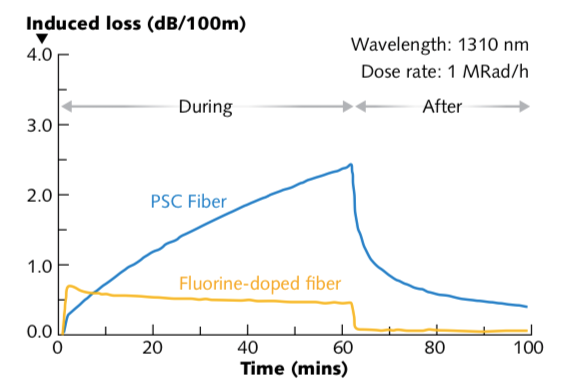 If longer lengths of optical fiber are to be used in high radiation environments, only fluorine doped fiber should be used. Fluorine-doped optical fiber is one of the most sophisticated radiation resistant solutions, and M2 Optics is offering the best radiation hard optical fiber in the market by partnering with renowned manufacturers such as Corning® or Prysmian®. Foley, Sean. (2009). Fluorine-doped core boosts radiation resistance of single-mode fiber. Laser Focus World. 45. 80-83. M2 Optics offers premium multimode fiber from manufacturers such as Corning® and OFS®, and we customize each module per customer requests.